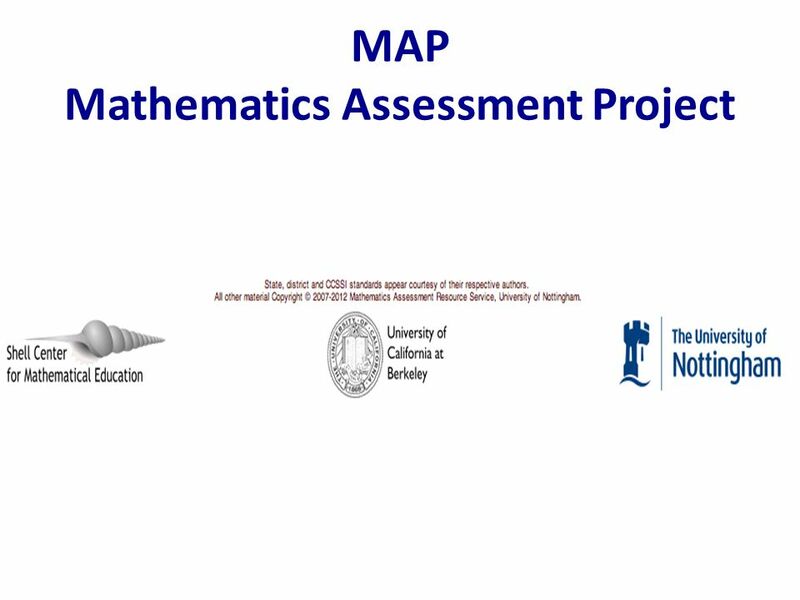 A Look at Module 4 and an Alpha FAL Network Meeting, September 5, 2012 Silicon Valley Mathematics Initiative www.svmimac.org Exploring MAP Offerings. 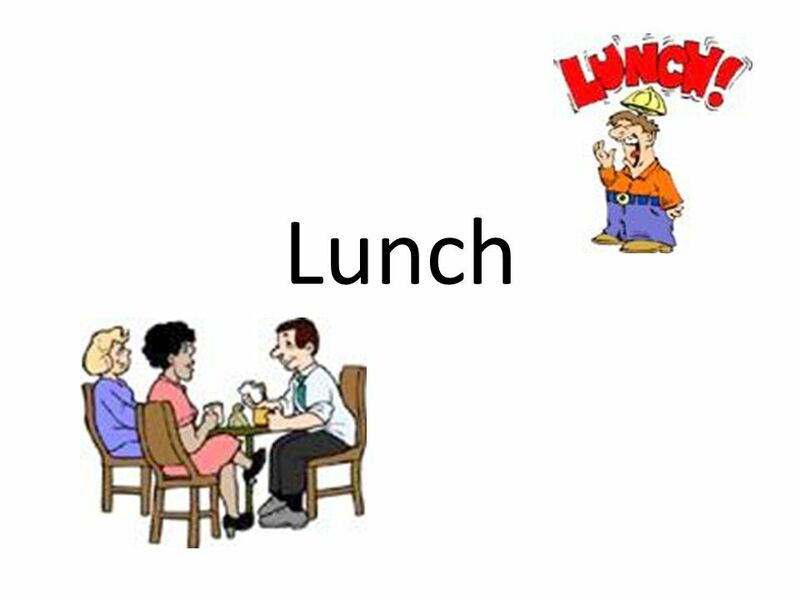 6 Introductions Arrange yourself in order by day of your birth (month and day) - without talking and with no sounds. Once in order, stay in order and we will introduce ourselves. 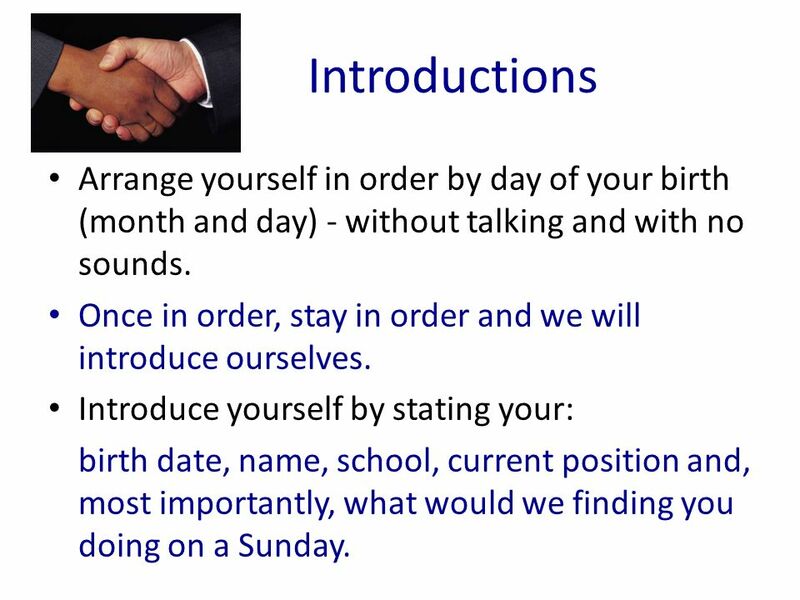 Introduce yourself by stating your: birth date, name, school, current position and, most importantly, what would we finding you doing on a Sunday. 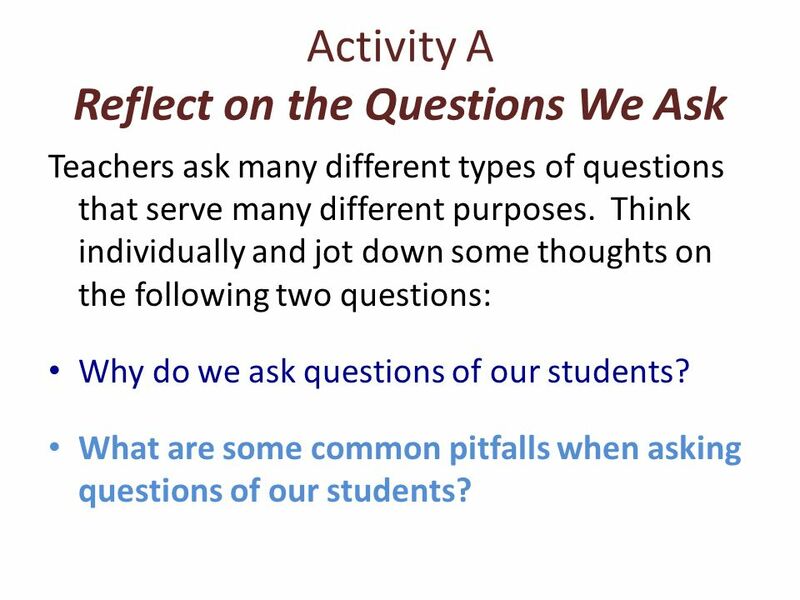 17 Activity A Reflect on the Questions We Ask Teachers ask many different types of questions that serve many different purposes. Think individually and jot down some thoughts on the following two questions: Why do we ask questions of our students? 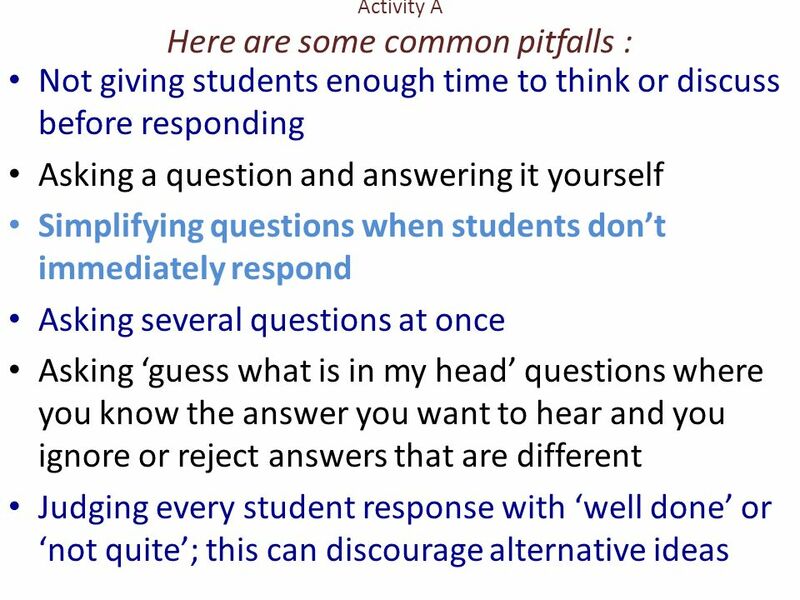 What are some common pitfalls when asking questions of our students? 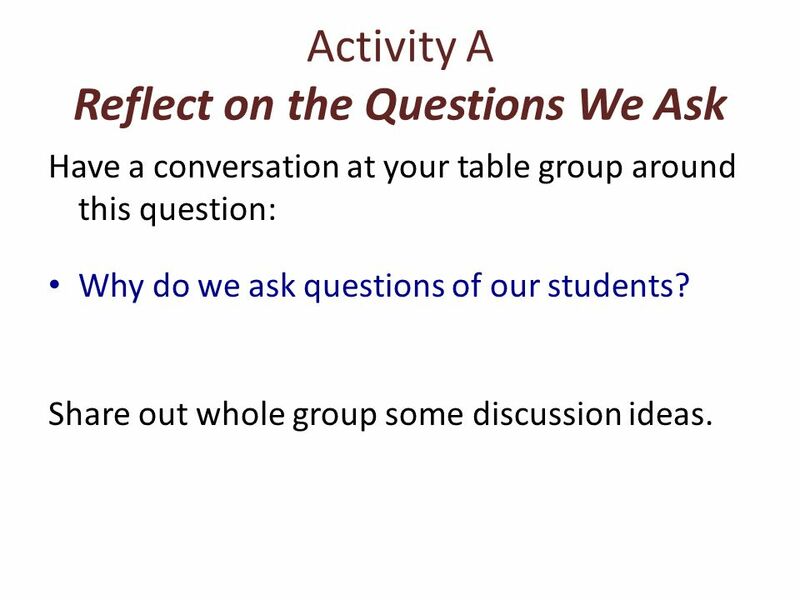 18 Activity A Reflect on the Questions We Ask Have a conversation at your table group around this question: Why do we ask questions of our students? 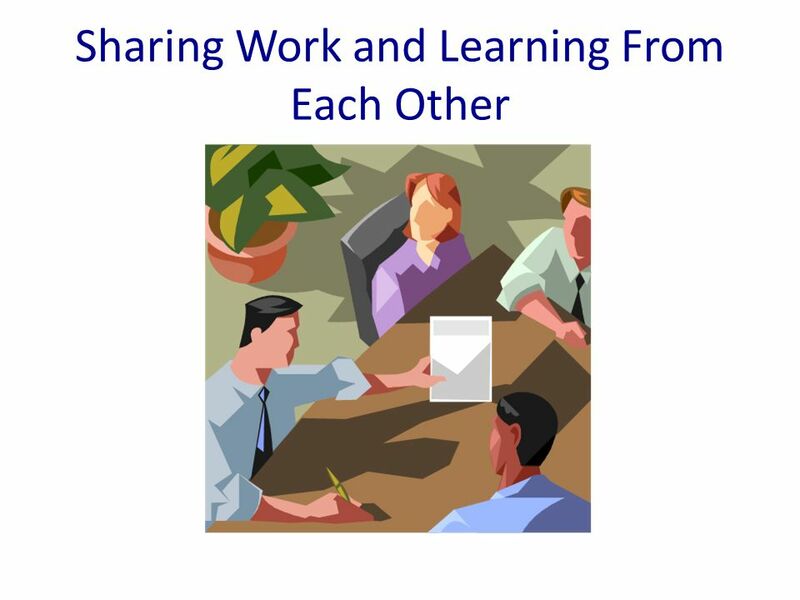 Share out whole group some discussion ideas. 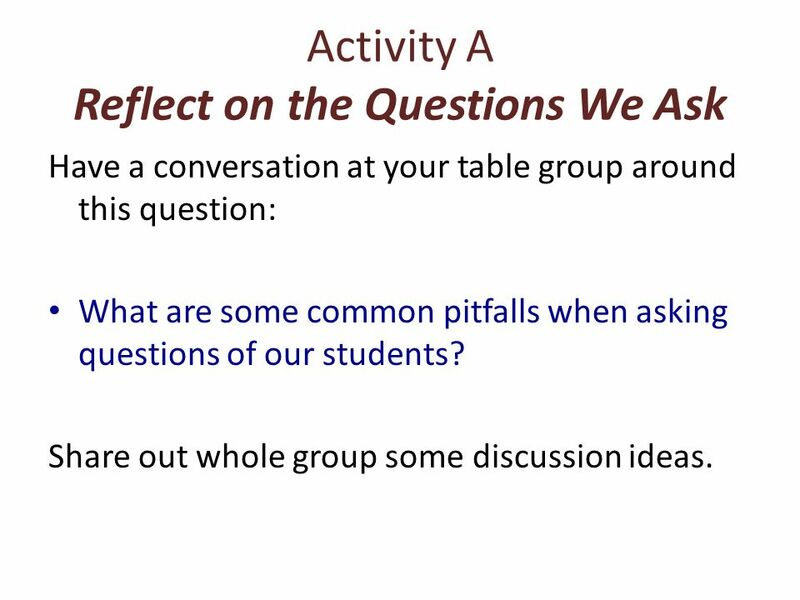 20 Activity A Reflect on the Questions We Ask Have a conversation at your table group around this question: What are some common pitfalls when asking questions of our students? 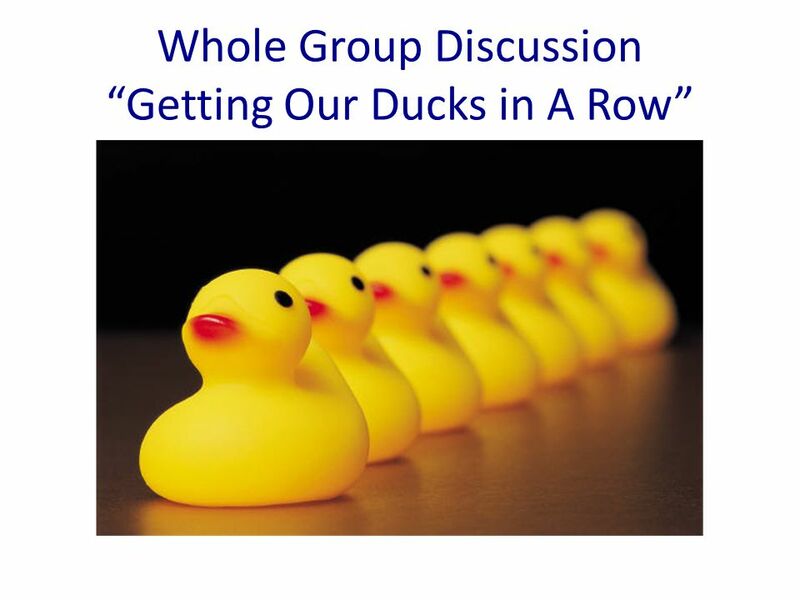 Share out whole group some discussion ideas. 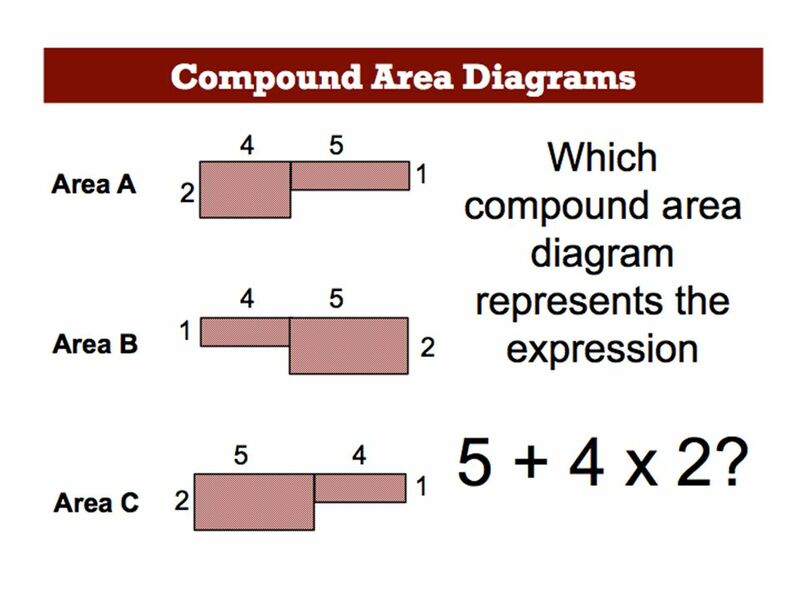 22 Activity B What types of questions develop thinking and reasoning? 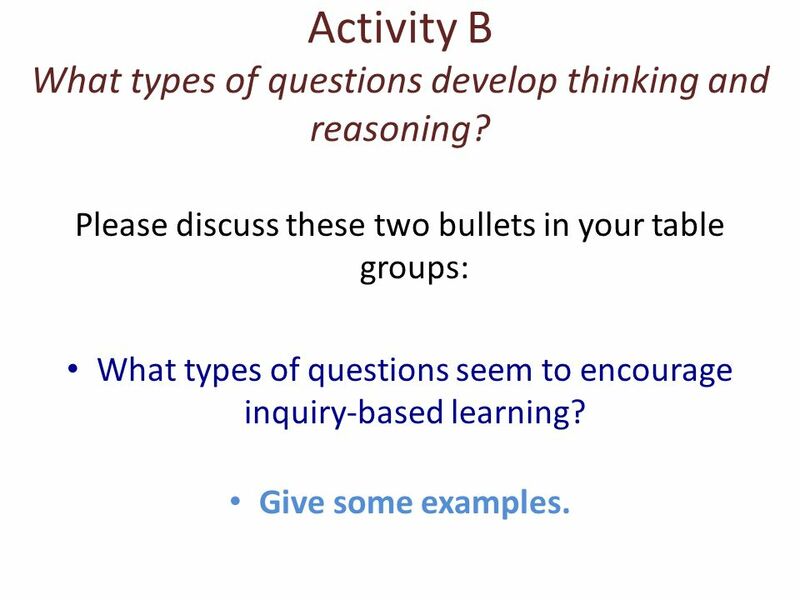 Please discuss these two bullets in your table groups: What types of questions seem to encourage inquiry-based learning? Give some examples. 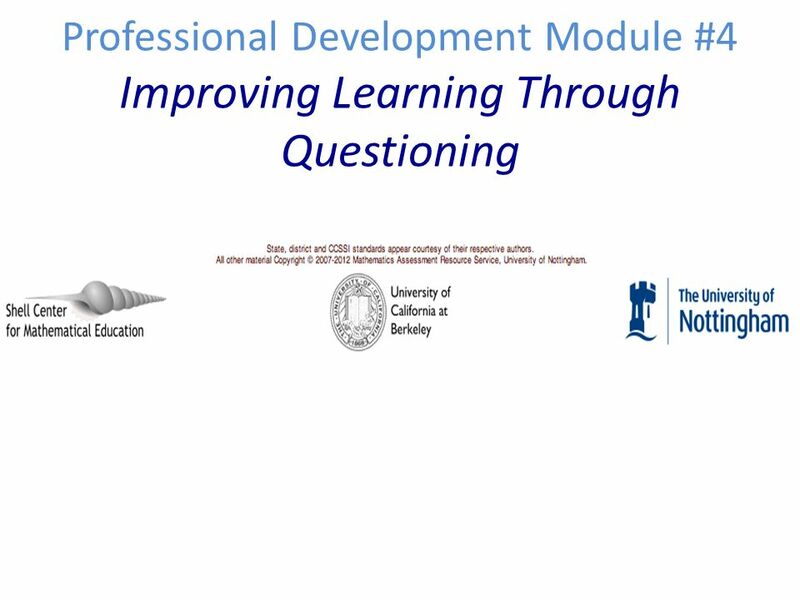 23 Activity B What types of questions develop thinking and reasoning? 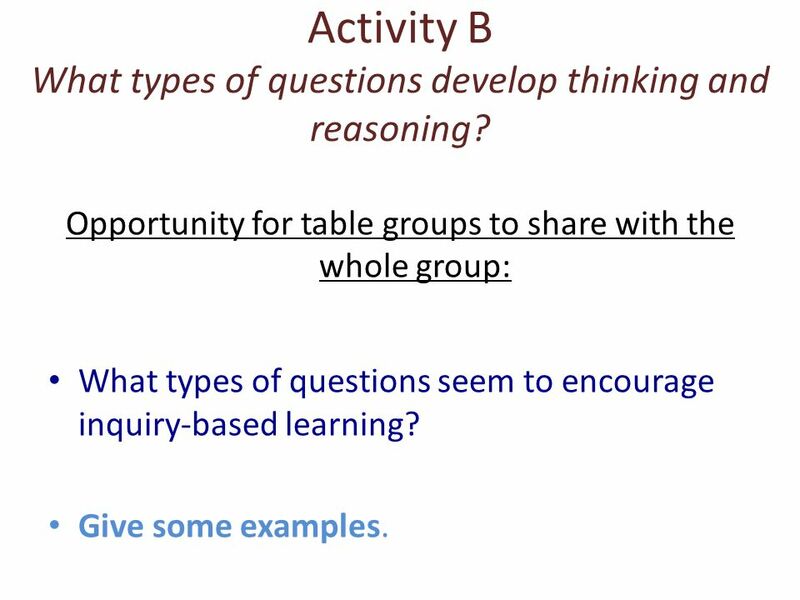 Opportunity for table groups to share with the whole group: What types of questions seem to encourage inquiry-based learning? Give some examples. 24 Activity B What types of questions develop thinking and reasoning? 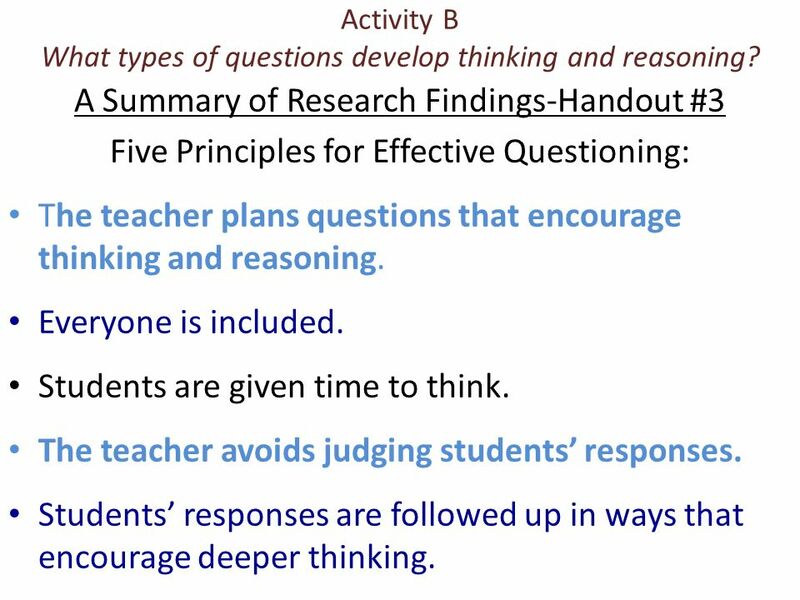 A Summary of Research Findings-Handout #3 Five Principles for Effective Questioning: The teacher plans questions that encourage thinking and reasoning. Everyone is included. Students are given time to think. The teacher avoids judging students responses. Students responses are followed up in ways that encourage deeper thinking. 25 Activity B What types of questions develop thinking and reasoning? 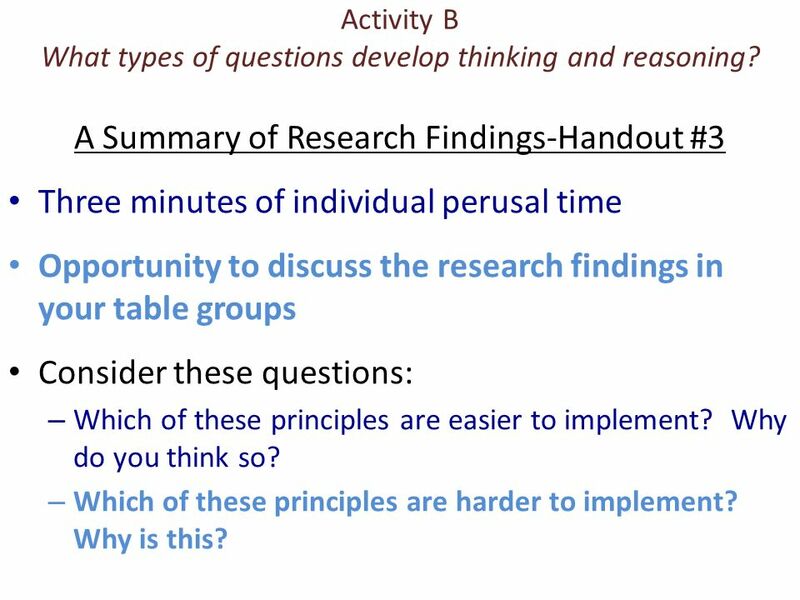 A Summary of Research Findings-Handout #3 Three minutes of individual perusal time Opportunity to discuss the research findings in your table groups Consider these questions: – Which of these principles are easier to implement? Why do you think so? 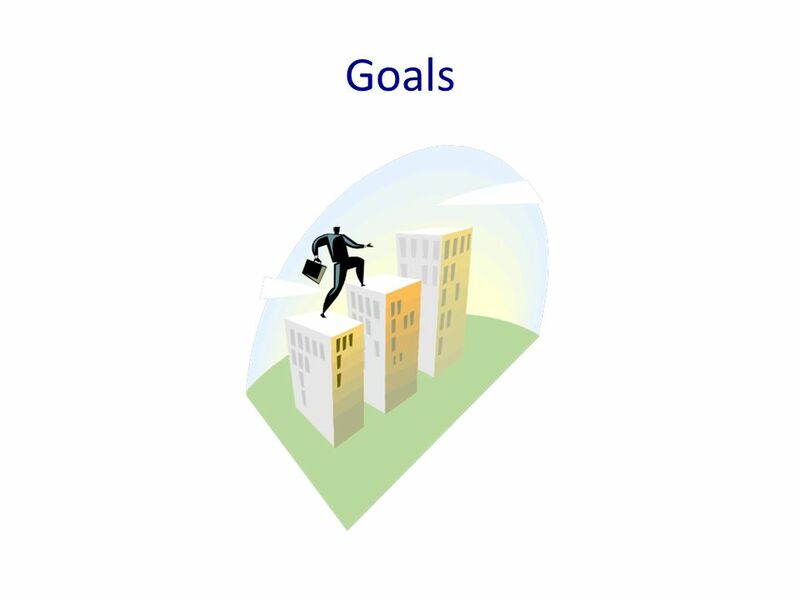 – Which of these principles are harder to implement? Why is this? 26 Activity B What types of questions develop thinking and reasoning? 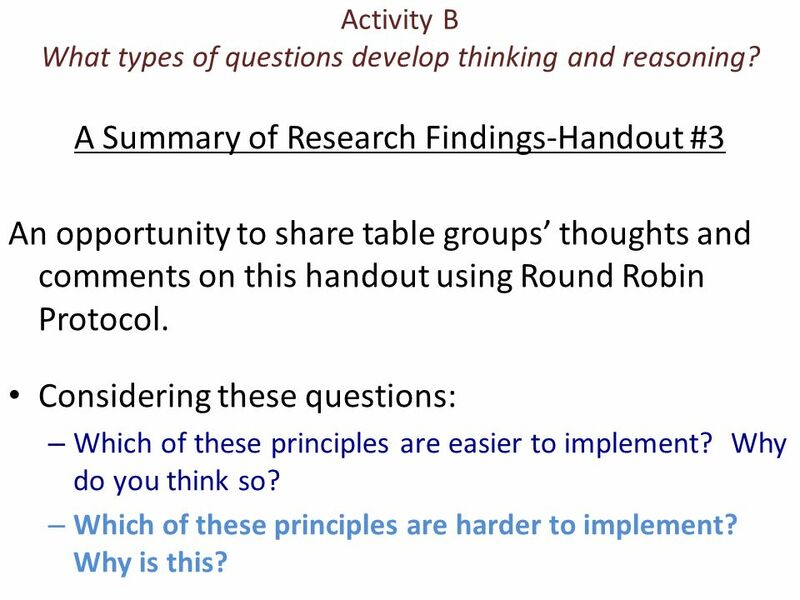 A Summary of Research Findings-Handout #3 An opportunity to share table groups thoughts and comments on this handout using Round Robin Protocol. 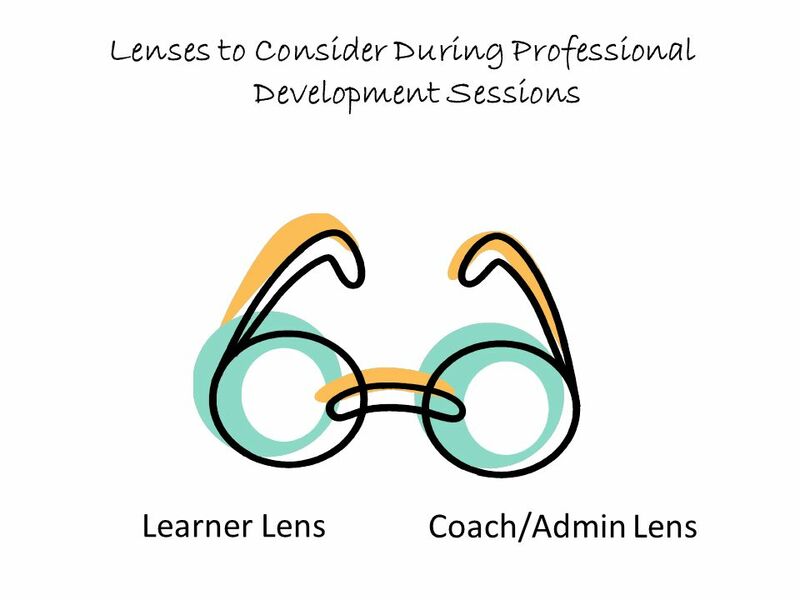 Considering these questions: – Which of these principles are easier to implement? Why do you think so? – Which of these principles are harder to implement? Why is this? 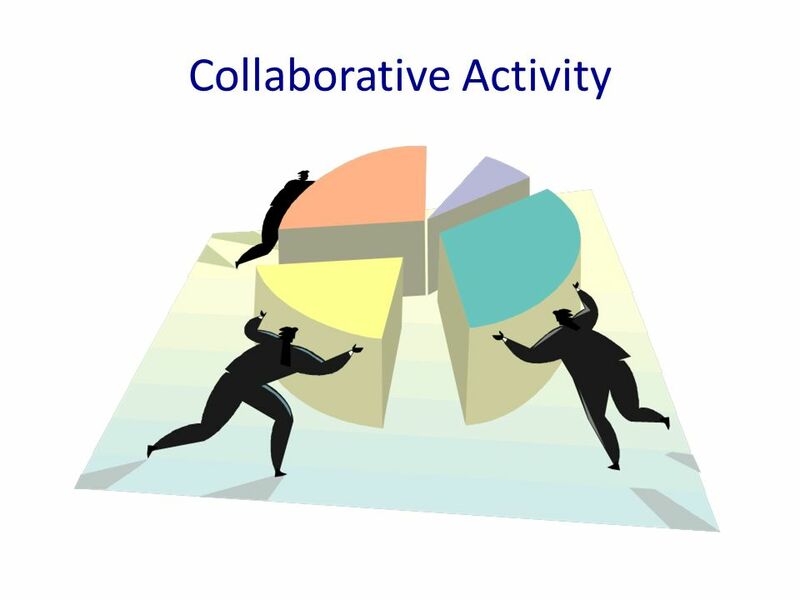 27 Activity C Observing and Analyzing a Lesson Take a few minutes to work out Sharing Gas Costs Share your ideas and thinking with a shoulder partner. With your shoulder partner, look at Method 1 and Method 2. Discuss which Method you consider to be better. Why do you think so? 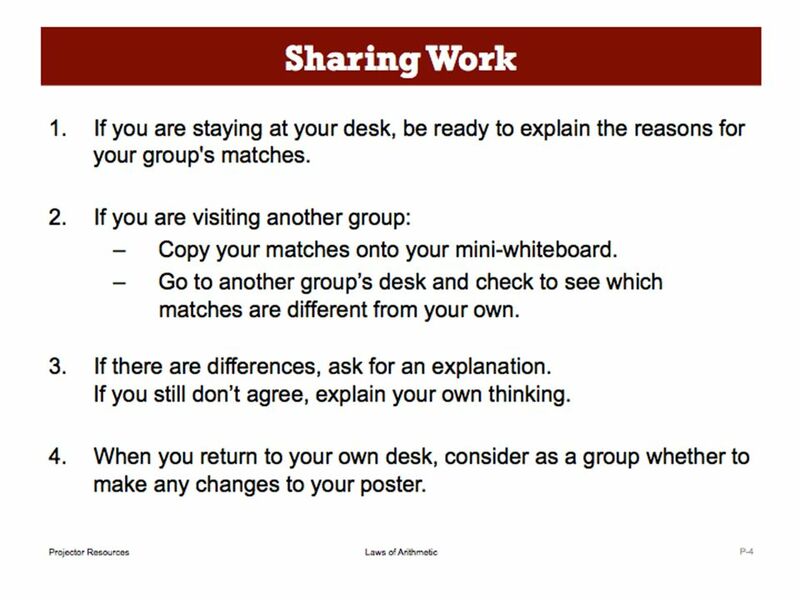 If time, share and discuss your thinking with the entire table group. 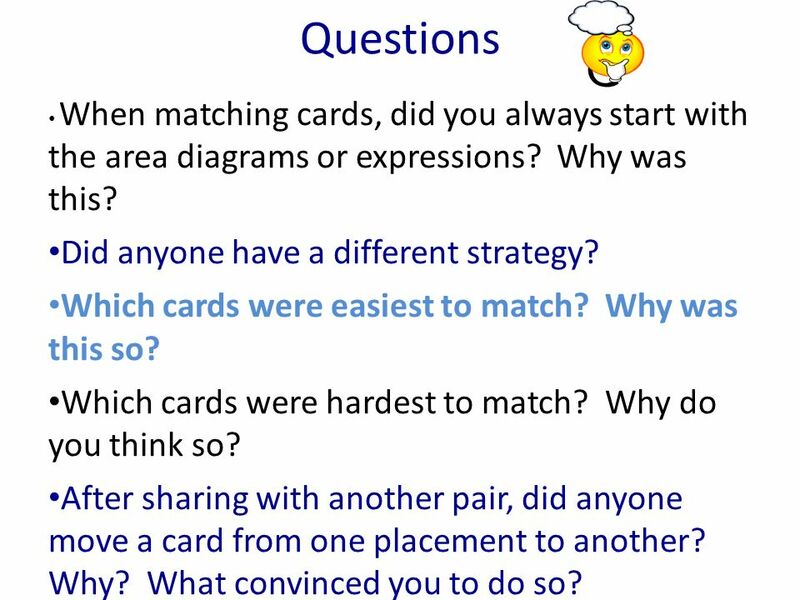 28 Activity C Observing and Analyzing a Lesson Watch this video clip and look for evidence on the 5 principles of effective questioning: – Were questions planned that encouraged thinking and reasoning? – Were questions asked that included everyone? – Were students given enough time to think? – Did the teacher avoid judging students responses? 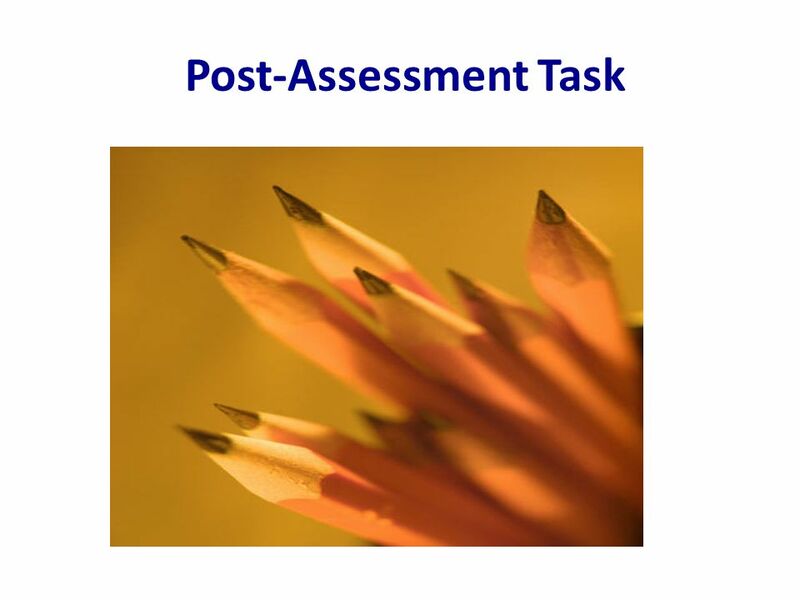 – Did the teacher follow up students responses in ways that encouraged deeper thinking? 30 Activity C Observing and Analyzing a Lesson Debrief of the video clip; what evidence did you see? – Were questions planned that encouraged thinking and reasoning? – Were questions asked that included everyone? – Were students given enough time to think? – Did the teacher avoid judging students responses? – Did the teacher follow up students responses in ways that encouraged deeper thinking? 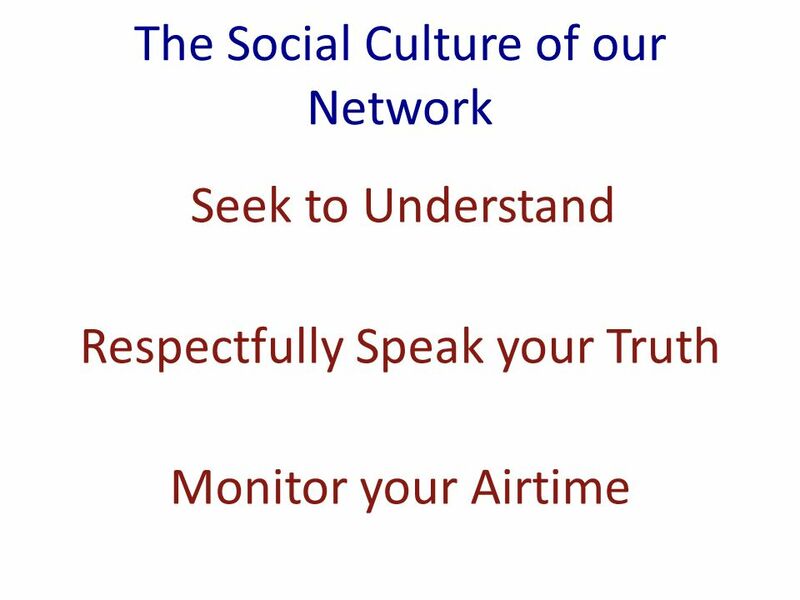 What do you think students learned from this lesson? 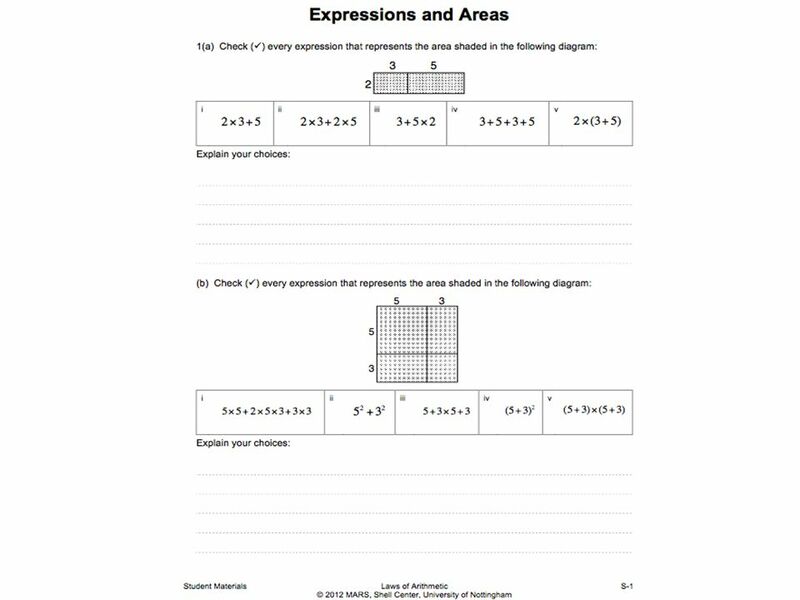 31 Activity D Plan a lesson, teach it and reflect on the outcomes. 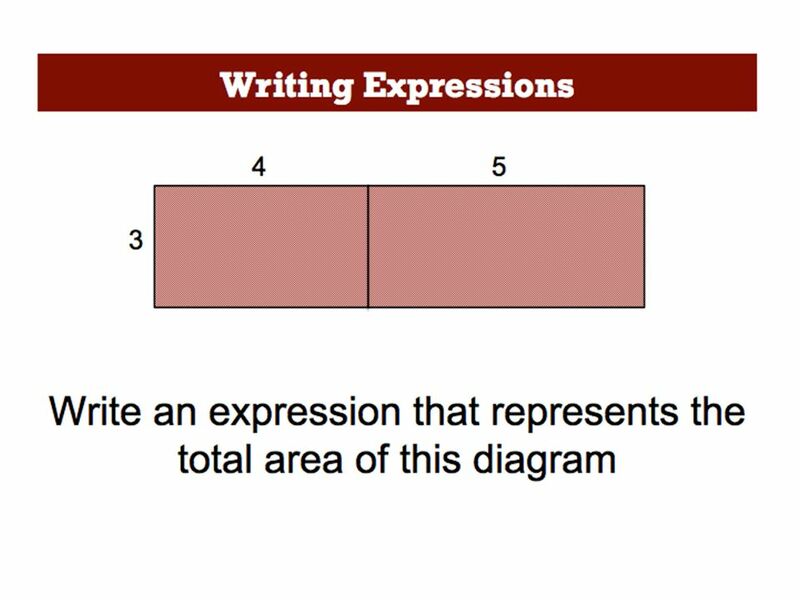 Select a problem to do with a class. 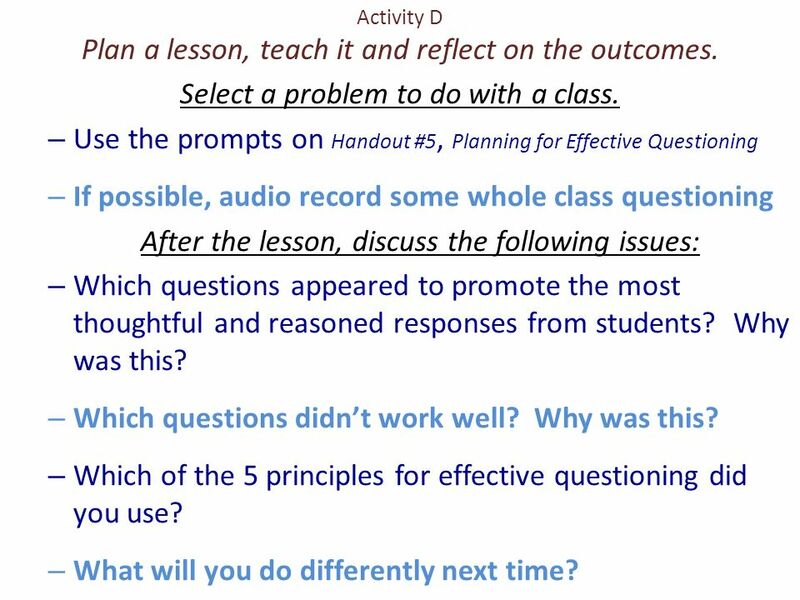 – Use the prompts on Handout #5, Planning for Effective Questioning – If possible, audio record some whole class questioning After the lesson, discuss the following issues: – Which questions appeared to promote the most thoughtful and reasoned responses from students? Why was this? – Which questions didnt work well? Why was this? 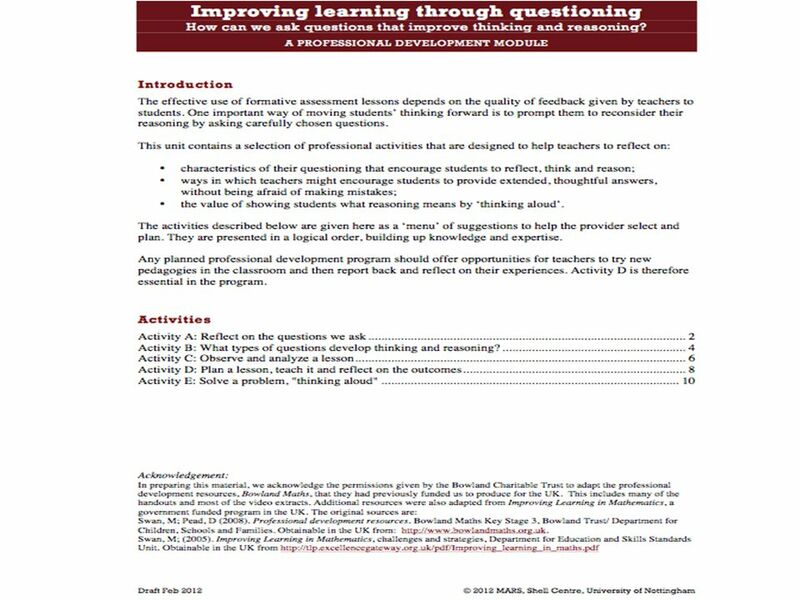 – Which of the 5 principles for effective questioning did you use? – What will you do differently next time? 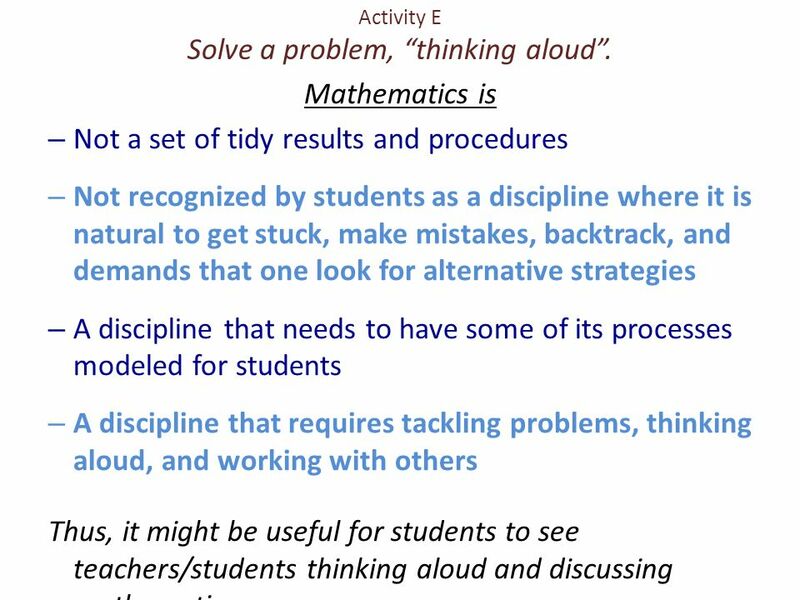 32 Activity E Solve a problem, thinking aloud. Mathematics is – Not a set of tidy results and procedures – Not recognized by students as a discipline where it is natural to get stuck, make mistakes, backtrack, and demands that one look for alternative strategies – A discipline that needs to have some of its processes modeled for students – A discipline that requires tackling problems, thinking aloud, and working with others Thus, it might be useful for students to see teachers/students thinking aloud and discussing mathematics. 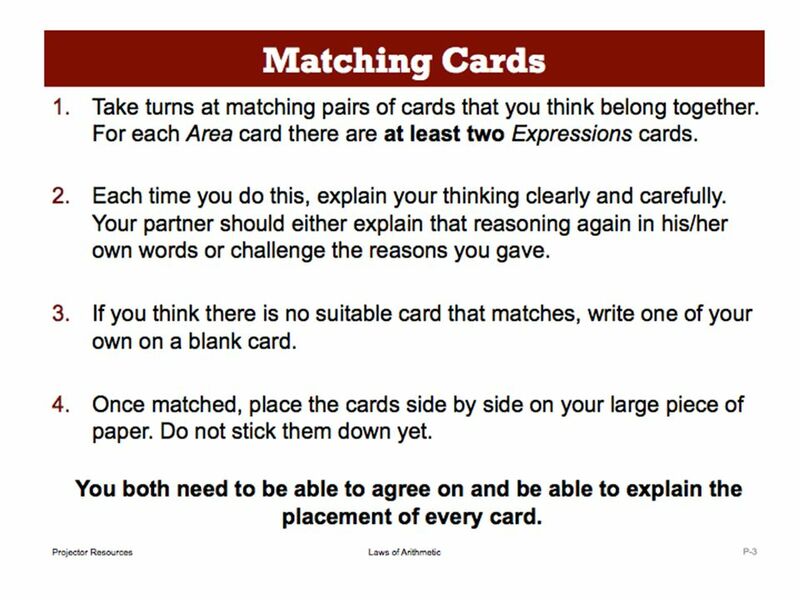 49 Questions When matching cards, did you always start with the area diagrams or expressions? Why was this? Did anyone have a different strategy? Which cards were easiest to match? Why was this so? Which cards were hardest to match? Why do you think so? After sharing with another pair, did anyone move a card from one placement to another? Why? What convinced you to do so? 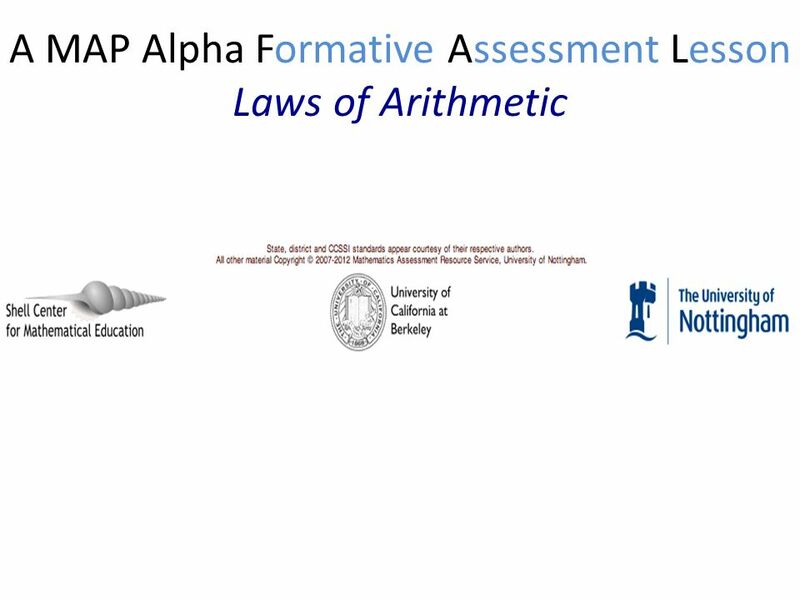 Download ppt "A Look at Module 4 and an Alpha FAL Network Meeting, September 5, 2012 Silicon Valley Mathematics Initiative www.svmimac.org Exploring MAP Offerings." Welcome to Day 3! Be sure to sign in.. 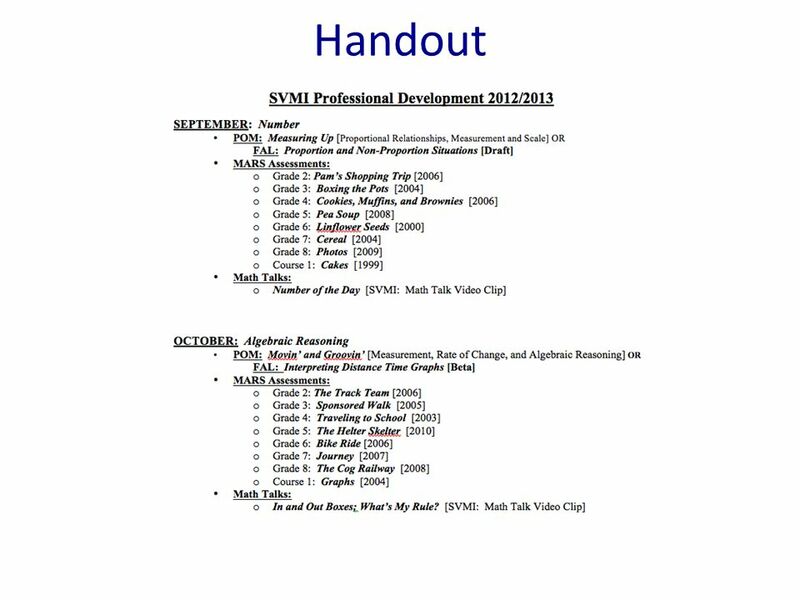 Agenda Comment Cards Problem of the Month: Double Down, ELD, and the Common Core Mathematical Practices Common. Silicon Valley Mathematics Initiative Network Meeting January 12, 2011. SVMI Network Meeting April 10, Assessing and Using Prior Learning to Adapt Teaching to the Needs of Students Network Meeting, April 10, 2013 Silicon. In the Era of the Common Core Standards Network Meeting, January 11, 2012 Silicon Valley Mathematics Initiative Assessment for Learning. 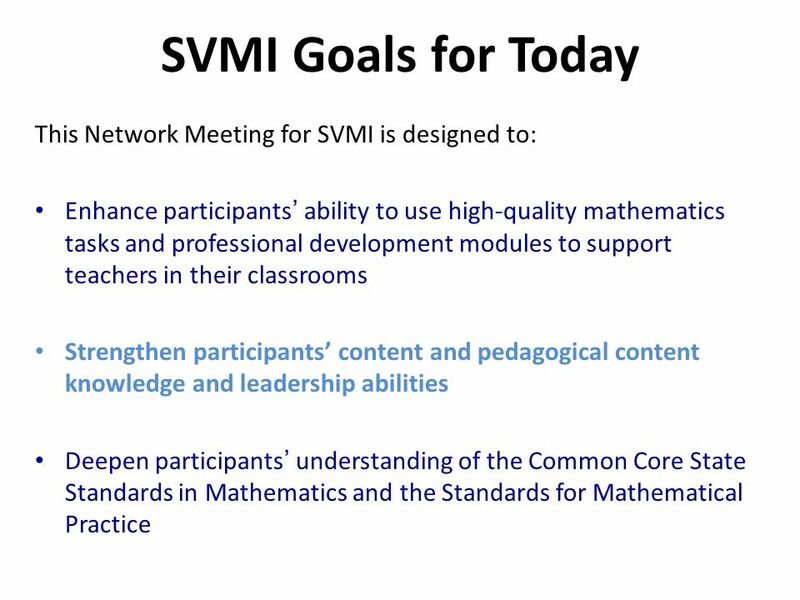 SVMI Network Meeting October 31, A Look at Module 5 and Collaborative Tasks Network Meeting, October 31, 2012 Silicon Valley Mathematics Initiative. Welcome to Day 3! Please do the following… Sign in and find your name tag. Help yourself to refreshments. Sit where there is a binder at the table with. 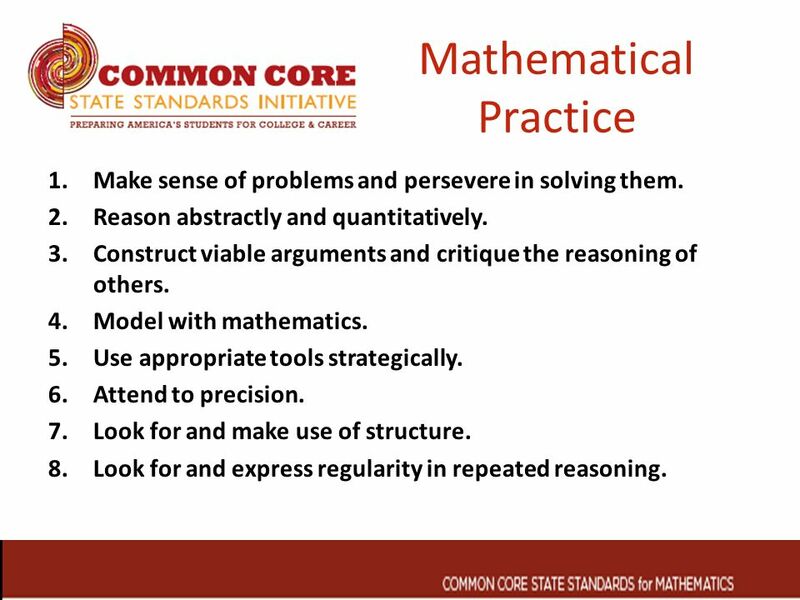 Common Core Mathematical Practices. 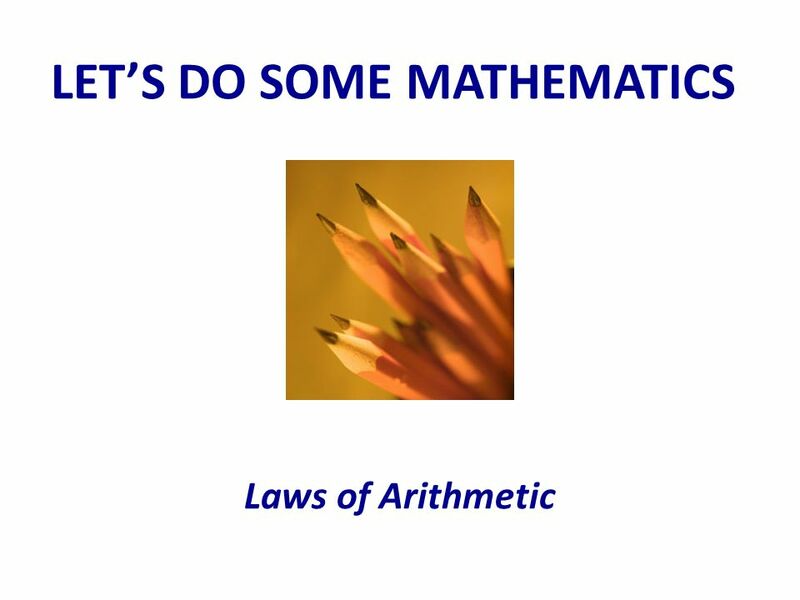 People who are good in math… Make sense of problems. Presenter Pam Williams, PhD Standards for Mathematical Practice (Kindergarten-Grade 5) Alabama College and Career Ready Standards for Mathematics K- 5. December 11, 2013 Algebra and 8 th Grade Kimberly Tarnowieckyi Last time together October 23. 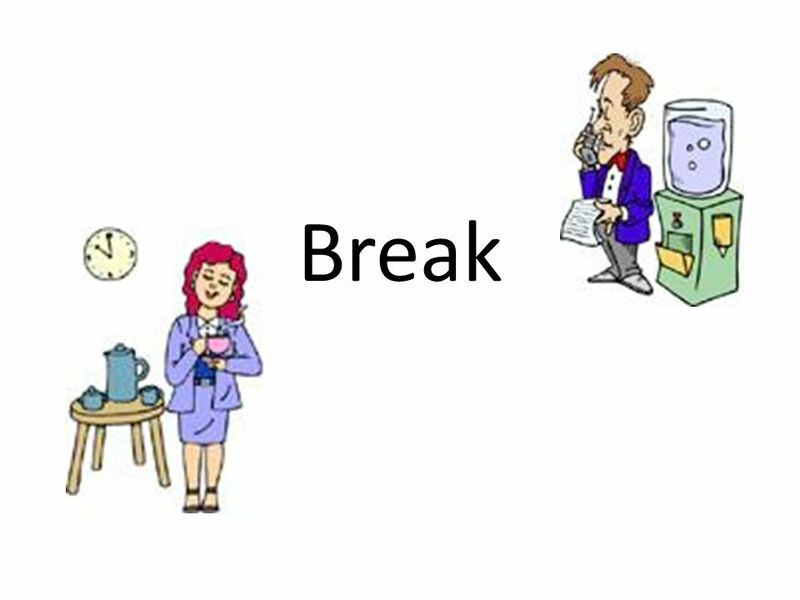 Think back over your lessons form October 24 to December. 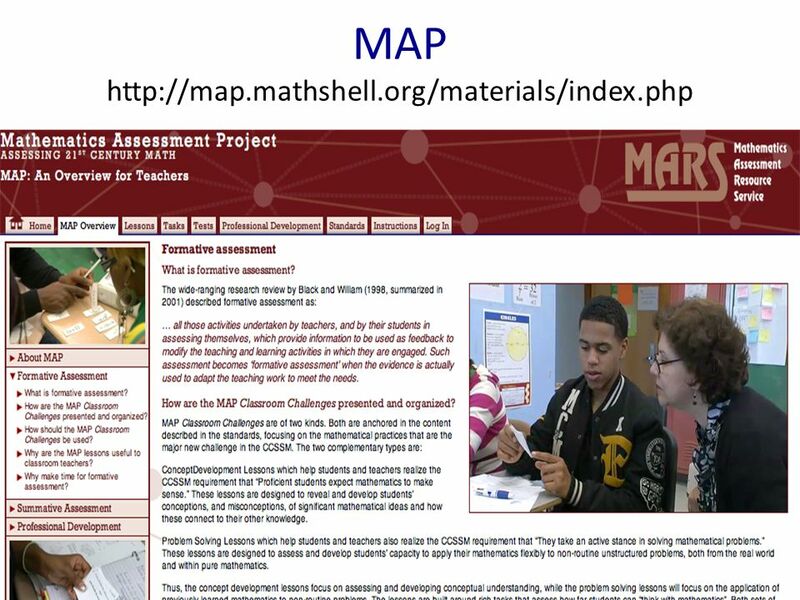 SVMI Concept Development Lesson Common Core State Standards- Mathematics (CCSS-M) Conference Mariana Alwell Professional Development Provider Silicon Valley. 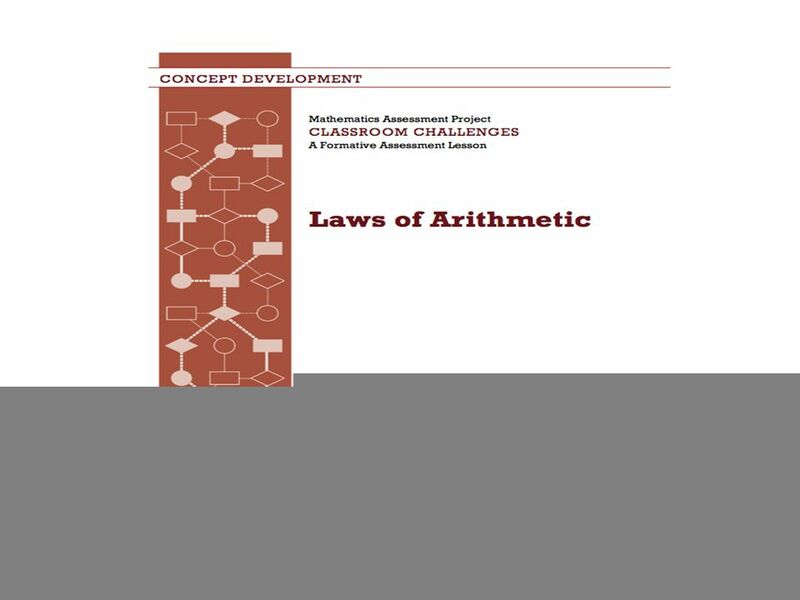 Office of Curriculum, Instruction and School Support 2012 Mathematical Practice 3: Construct Viable Arguments and Critique the Reasoning of Others Mathematics. Discourse and Mathematical Argumentation in the Classroom Wednesday, June 6, 2012. 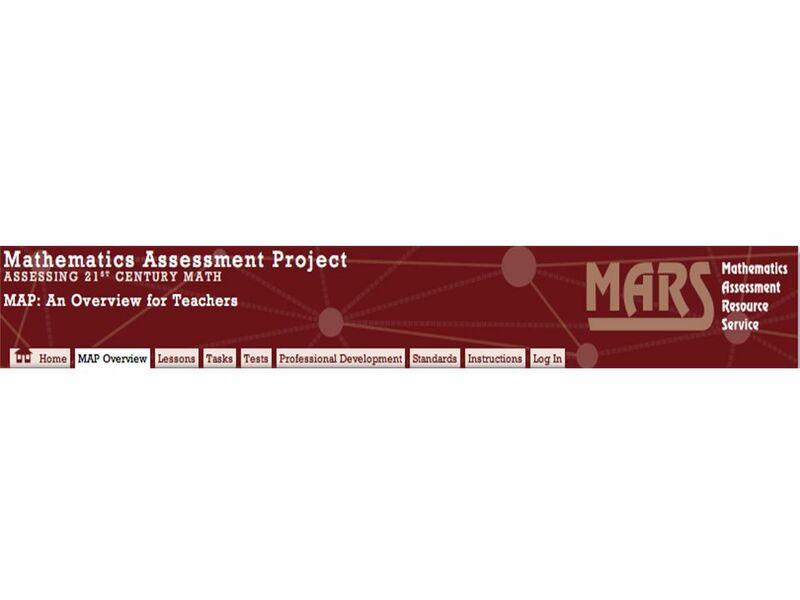 K–12 Session 4.3 Standards for Mathematical Practices Part 3: Looking for the Practices through Observation Module 1: A Closer Look at the Common Core. What Happened? 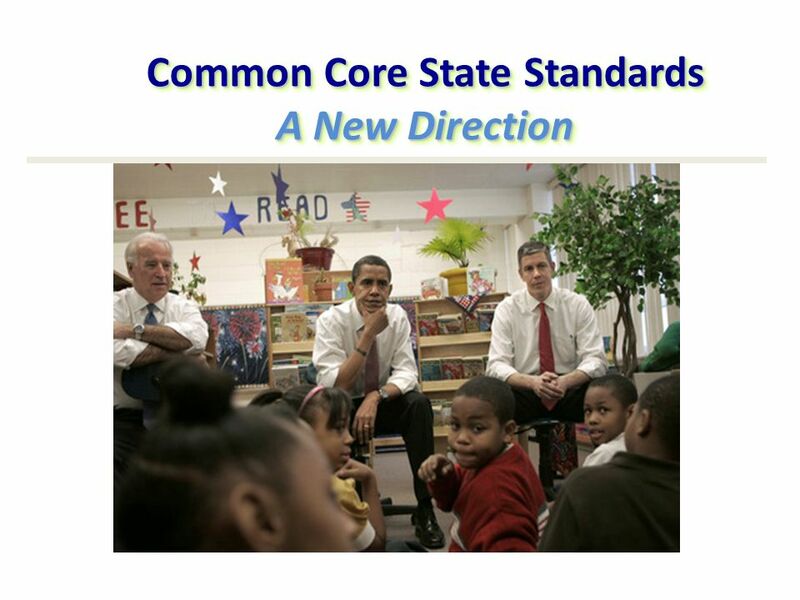 In your group, discuss what happened in your district regarding SB 1 after our last meeting. 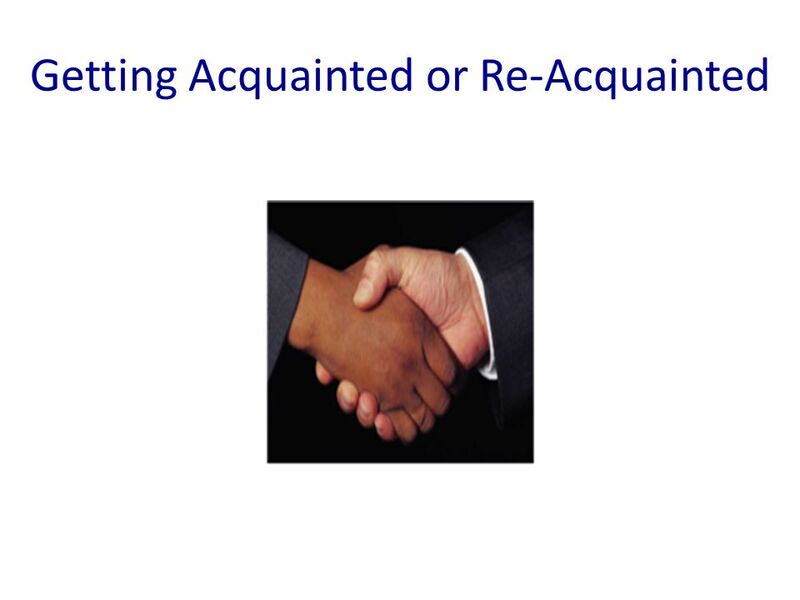 Each group will share (1)one positive outcome. 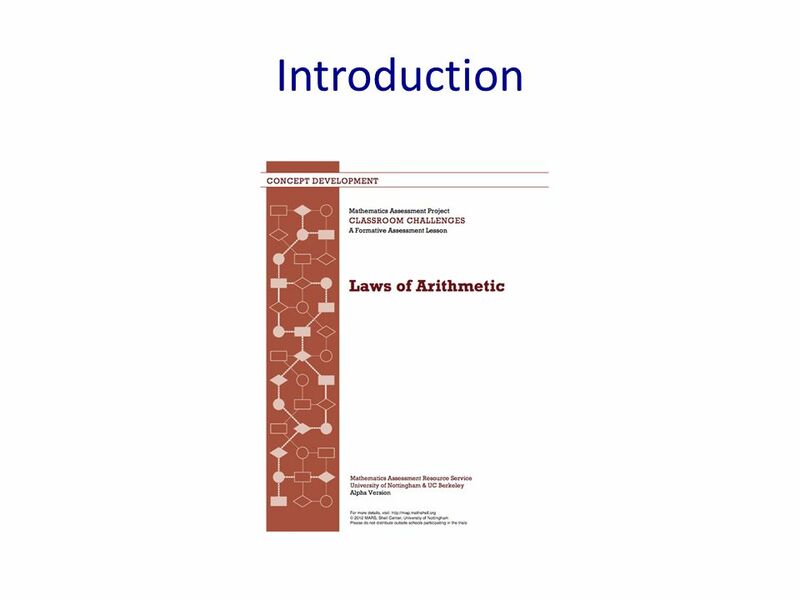 Mathematical Practices 1.Make sense of problems and persevere in solving them. 2.Reason abstractly and quantitatively. 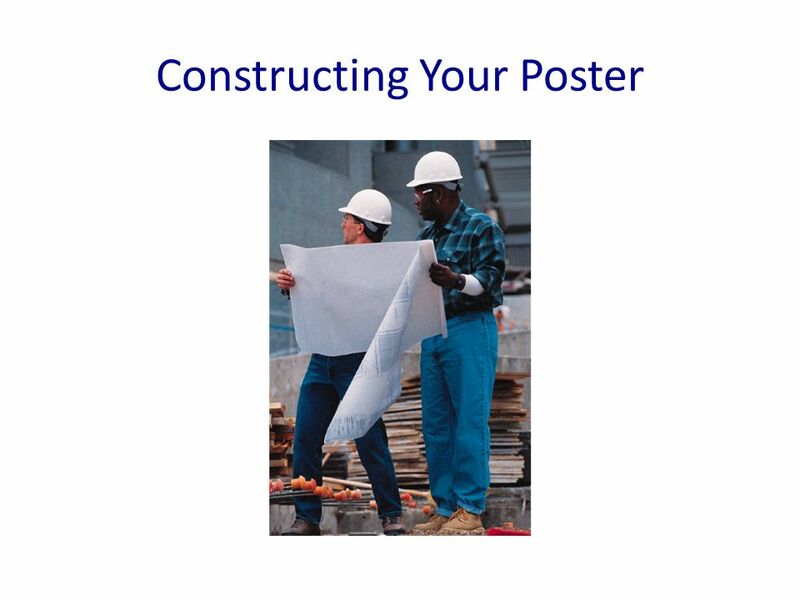 3.Construct viable arguments and.